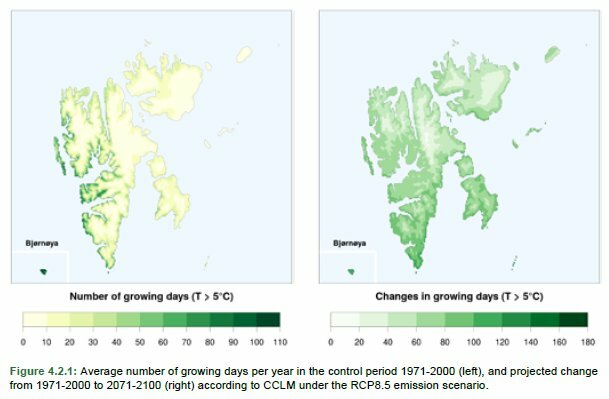 The report from the Norwegian Centre for Climate Service establishes a broad knowledge base for climate adaptation. The report was commissioned by the Norwegian Environment Agency in order to provide basic information for use in climate change adaptation in Svalbard. It includes descriptions of historical, as well as projections for the future climate development in the atmosphere, hydrosphere, cryosphere and ocean, and it includes effects on the physical nature e.g. on permafrost and various types of landslides and avalanches. The projections for the future climate are based on results in the IPCCs fifth assessment report. The report is to a large degree an assessment of existing literature and model results. New results from atmosphere, ocean and hydrological models are, however, also presented.